A Barnt Green resident aims to ensure that his uncle, who died 100 years ago in the First World War aged just 15, is not forgotten. Alfred Eves was named after his father’s brother, Alfred Frederick Eves, who joined the Royal Marine Light Infantry as a bugler when he was 14 and served on the HMS Queen Mary. During the Battle of Jutland, the ship was sunk in Scapa Flow by German battlecruisers on May 31, 1916 – more than 1,200 sailors were lost. Alfred Frederick’s memory has been kept alive over the years by his family, with his nephew now in possession of photographs, letters and memorabilia that tell the young sailor’s story. These include the “death plaque” sent to all bereaved families, a Queen Mary pincushion that Alfred Frederick sent home to his mother, and a cigarette tin and bullet-shaped pencil case received by all sailors and soldiers as a Christmas gift from Princess Mary. Alfred also has his uncle’s medals, a copy of his war record, death notice and note of condolence from the King – as well as a large collection of letters that Alfred Frederick wrote to his family in Lickey End. Alfred Frederick is commemorated on the Portsmouth Naval Memorial at Southsea – and of course, his name lives on in his nephew: “My dad made sure I was named after my uncle, and I want to make sure he is remembered,” says Alfred. 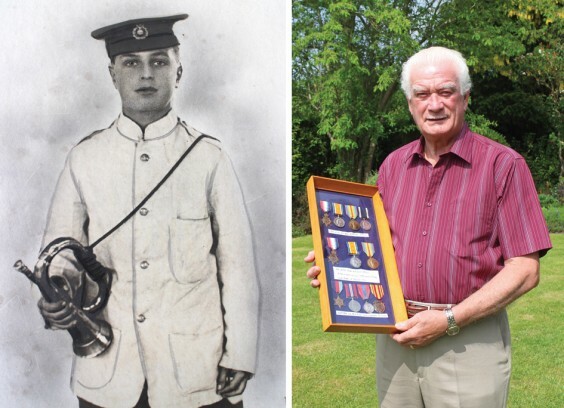 Although he didn’t follow his uncle, father and grandfather into the military –”National Service had finished by the time I was old enough!” – Alfred is still doing his bit for British forces by his involvement in the Troop Aid charity. After hearing a talk on the initiative, which supplies essential clothing and toiletries to injured servicemen and women, Alfred’s wife, Pam, set up a collection point at Barnt Green parish council office. People can donate toiletries for the “Grab Bags” which are given out at field hospitals overseas and also in the UK, where injured troops arrive without their personal effects. “It’s about making them feel human and giving them some dignity,” says Alfred, who assists Pam in her role as Troop Aid co-ordinator. Above: Alfred Frederick Eves (left) and the younger Alfred with medals belonging to his uncle, father and grandfather.